Welcome to the virtual representation of the goings on in and around the Whitby Area Sheds. There’s SAMS, the classic, original North Yorkshire Shed for men in unique Littlebeck. The Whitby Women’s Shed (aka the She Shed) and the Whitby Men’s Shed WHIMS, both in central Whitby at the Eskmouth Scout Hut. And now in the course of development Sheds in Staithes to serve the Mulgrave area. Every Shed is unique because the group of individual Shedders is unique. However, there are important fundamentals in common t hat are well expressed on the reverse of our promotional postcards. They are our ethos. 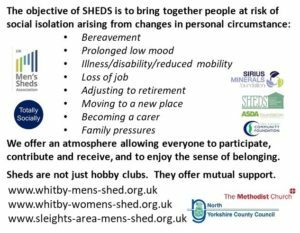 Sheds are not just hobby clubs. They are places where men or women can come who are at some kind of a loss such as those listed. They are places that are inclusive, where everyone can participate, contribute and receive mutual support. It is not counselling. It is not care. It is about caring, however. Looking out for each other and being encouraging of each other in what people attempt to do. 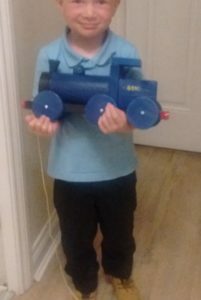 It was not the high quality of the toy trains Shedder Roger made that was important (quality is in the eye of the beholder!). The quality was in the little team of ever changing conscript elves who worked under Roger’s leadership (?) to put smiles on the Christmas faces of several children. It’s not what you do but the way that you do it.